Yesterday afternoon I popped in for another look at Editions 2015 at Tacit Contemporary Art. The opening on 11 February was so crowded there was scant time to look at the work, let alone absorb any of it; I didn't even have a chance to see my own. As it turns out, it's a terrific show. Printmaking is clearly alive, well and revelling in its seemingly infinite diversity. The work is beautifully presented too - Keith and Tim have done a fantastic job of the hang. It was good to meet fellow exhibitor Soula Mantalvanos and her husband Theo at long last. When I arrived, Soula had just finished a talk to a group of years 11 and 12 students. I'm sorry I missed it. From their general demeanour, it looked as if it was an inspiring success. One of the students is pictured directly below, in front of my Homo-insecta linocuts. Due to the magic of the multiple, four of the Homo-insecta are concurrently on show at Aratoi, Wairarapa Museum of Art and History in Masterton, New Zealand in a continuation of last year's Near Neighbours. The exhibition opened on 13 February and runs until 29 March. Thank you, Paulette Robinson for sending the photograph below via Near Neighbours co-curator, Rona Green. An unexpected bonus of having a studio in my back garden is the regular visits I receive from various members of the insect and arachnid kingdoms. Meanwhile, a fully formed Indian Leaf Butterfly Woman rests on my drawing board. 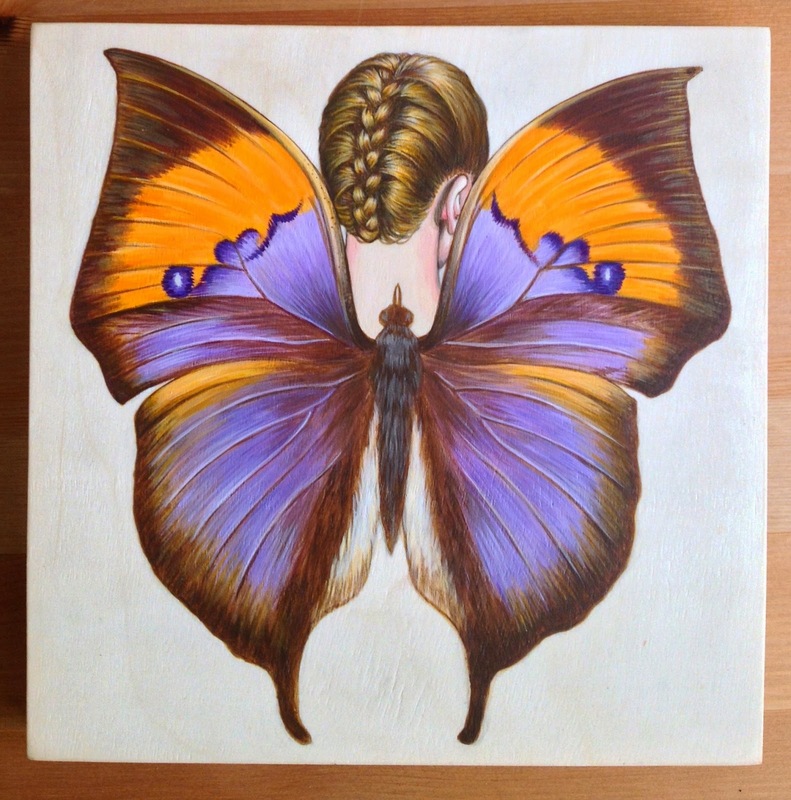 Indian Leaf Butterfly Woman, 2015, acrylic on wood, 20 x 20 cm. Recently completed, this is the first of a series of paintings intended as companion pieces to the ongoing Homo-insecta watercolour series that I begun in 2014. 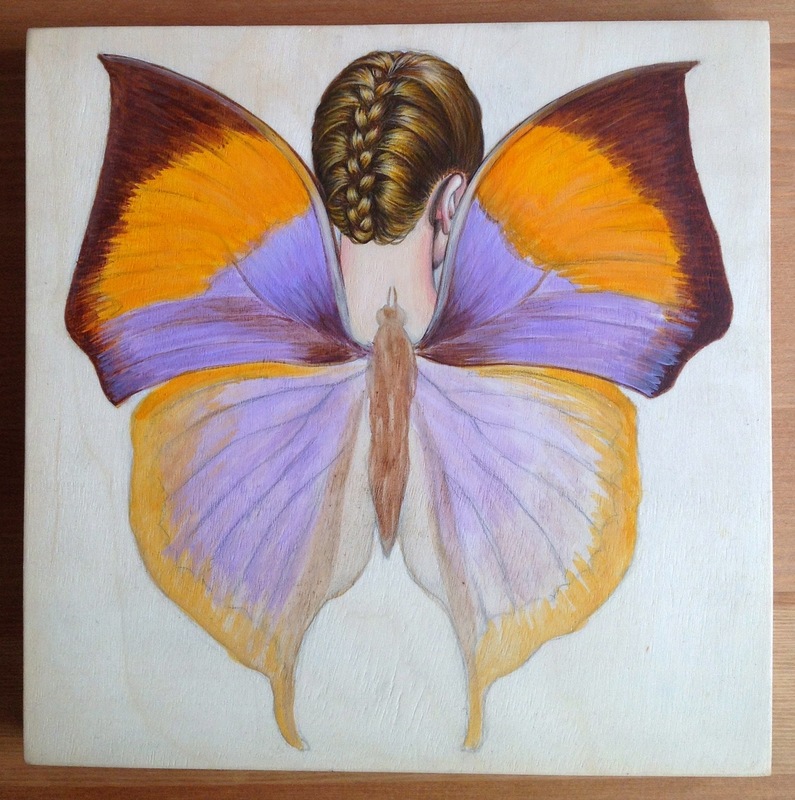 The luminous, linear clarity of Hans Holbein's portraits on wood were very much on my mind when I made this work. Currently he is the artist whose paintings are most strongly represented on my revamped studio notice board. The works of Lucas Cranach the Younger, the Clouet Brothers and William Larkin (which also feature on the board) are some other points of reference. (For links to all of these artists, scroll down to Postcards, Blog Post Saturday, January 24). acrylic on canvas, 18 x 13 cm (each panel). Private Collection. Click on image to enlarge. When I tentatively published my first blog post on August 12, 2008, there's no way I could have foreseen that blogging would develop into a significant extension of my art practice. Unlike social media, where users are inundated with information on a minute-by-minute basis, and where there is a knee-jerk tendency to scroll right by, the website and blog sites are where people can, if they are so inclined, choose to find me; they may even decide to linger awhile. Once in a great while I've questioned why I bother to put so much energy into something so ephemeral, but never for long - I derive too much pleasure and satisfaction from blogging for it to become a serous concern. Now, it seems it never will be. 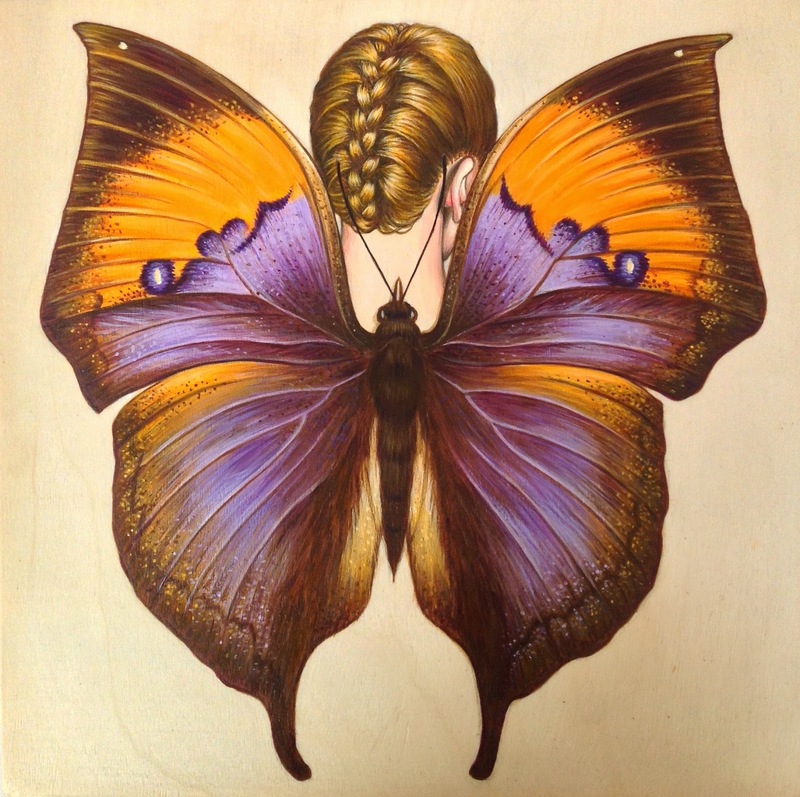 Recently I received an email from the National Library of Australia requesting a license to include the website Deborah Klein Australian Artist (designed and maintained by Doug Willis) Deborah Klein's Art Blog and its sister blog, Moth Woman Press in PANDORA, Australia's Web Archive. Instigated by the library in 1996, the archive focuses on "identifying and archiving online publications that meet our collecting scope and priorities". PANDORA's intention is "...to build a comprehensive collection of Australian publications to ensure that Australians have access to their documentary heritage now and enable the archiving and provision of long-term access to online Australian publications." Copyright has duly been granted to the Library, ensuring that they "will take the necessary preservation action to keep the website and blog sites "accessible as hardware and software changes over time. The Library will catalogue the websites and add the records to the National Bibliographic Database (a database of catalogue records shared by over 5,200 Australian libraries), as well as to their own online catalogue..."
Needless to add, I couldn't be more delighted. To learn more about PANDORA and for access to archived titles, visit the website HERE. Artists include: Elizabeth Banfield, T J Bateson, Jazmina Cininas, Tom Civil, Louise Donovan, Kevin Foley, Peter Garnick, Zoe Geyer, Silvi Glattauer, Janet Goldman, Pete Gurrie, Carolyn Hawkins, Jodi Heffernan, Ying Huang, Kate Hudson, Anita Iacovella, Kyoko Imazu, Sheridan Jones, Hyun Ju Kim, Deborah Klein, Damon Kowarsky, Kir Larwill, Anita Laurence, Marion Manifold, Soula Mantalvanos, Scarlett Mellows, Rachael Ness, Sharron Okines, James Pasakos, Cat Poljski, Stephanie Jane Rampton, Trudy Rice, Lisa Sewards, Georgina Whish-Wilson and Joel Wolter. The exhibition continues until 1 March. Jewel Beetle Woman, 2014, hand coloured linocut, 56 x 38 cm, edition size: 20. Printed by Simon White at the Australian Print Workshop, Melbourne.